It is time to leave Indonesia for a while, for the 2 months maximum stay of my visa is almost finished. In order to be able to return to Indonesia, it is necessary to apply for a new visa in another country. I have choosen to go to the Philippines, a country where I have not been before and where one can travel visa-free for 1 month. The bike stays behind in the guesthouse in Kuta and I will spend the next 3 weeks backpacking on the largest island of the Philippines, Luzon. The hotel I have chosen in Manila is located 600 meters from the Indonesian embassy. But when I go there the day after my arrival, there is an unexpected setback, when I learn that this embassy demands a LOI (Letter Of Invitation) if I want to stay in Indonesia for more than 1 month. To my question why in heaven’s name different visa rules apply in different countries , I get a friendly (oriental) smile for an answer. Still looking for a person or agency for this invitation letter, which requires extra time, is not my preference. The agglomeration Metro Manila consists of more than 16 cities and municipalities. A total of nearly 13 million people live here. Pressure, air pollution, traffic congestion … It is not the optimal holiday destination. A stay of 2 days here is sufficient for me to get some first impressions of this country. The local food is not great and there are many fast food restaurants. I am lucky to I stay near a Japanese neighborhood with a wide choice of delicious Japanese food, like sushi, tuna sashimi, seaweed and even a bottle of sake. Delicious, delicious, delicious! Eating these delicious dishes, the desire to visit Japan becomes ever greater. Incidentally, Korean cuisine is also appealing to me more and more. The Filipinos have the same positive characteristics as the Indonesians. They are friendly, personable and hospitable, have a sense of humor and are relaxed in traffic. The big difference with the Indonesians is their knowledge of the English language. As the country is a former colony of the U.S., English is still being taught in the schools. Another legacy of Americans is the love of basketball. It is the Filipinos national sport, not football. The Filipinos are small and I have not seen any two meter tall basketball players , but maybe there are some in the national team. But the Americans left even more things behind when they left the country after the Second World War. Thousands of Jeeps stayed behind. The Filipino’s converted these into buses and called them jeepneys, the famous vehicles for urban and regional transport. The old Jeeps have disappeared by now and made way for the more modern version. 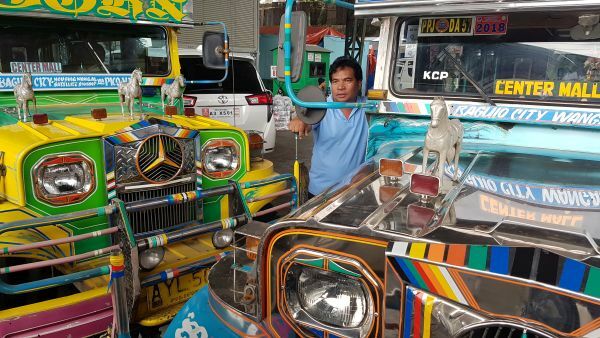 The Jeepneys are owned by the driver and they like to give them a personal touch, often very artistic (or kitschy?). A sight for sore eyes with lots of chrome, fringes, figurines on the bonnet and often tasteful color combinations. Wouldn’t it be nice to travel around the world in such a car? Filipinos love country music and American evergreens. At one time I was sitting in a taxi and the driver sang an old well-known song by Jim Reeves. At first he was singing quite gently, but I also knew the next song from the past and started to sing along. The song Bimbo made us forget that we had been in a traffic jam for a long time. Of course, I am also interested in the local history and so I visit Fort Santiago, the large Chinese cemetery and the Manila North Cemetery, where the less fortunate live among the graves and where a whole city district (including shops) has been created (no photographs! ), as well as a number of monuments of the national hero José Rizal. A luxury air-conditioned bus takes me 250 km to the north, to the university city of Baguio. The streets are flooded with youthful, exuberant students in neat and colorful uniforms. The main street is a chain of fast food restaurants and finding another type of restaurant turns out to be quite difficult, but successful in the end. Time to try something new: Sizzling. A dish of pork (thick fat slices) or chicken with vegetables and sweet potatoes in a cast iron flat dish. I prefer the chicken version, I do not really like those quivering fat slices of pig. The whole is served piping hot on a board. Do not touch with your fingers … Blisters !! And do not pour the supplied gravy directly over the dish … An explosion of glowing hot splatters over table and clothes !! Baguio lies at the beginning of the central mountain range of North Luzon, the Cordillera Central. An area with high forested mountains and traditionally inhabited by different tribes, each with their own language and culture. They have been converted to Christianity, but many old customs are still practised, such as their own laws and funeral rites. Not so long ago the blood vendetta still existed and heads were still being hunted. It seems unlikely, when you see the people walking around now in Western clothing and busy with their smartphones, but it turns out that their own jurisdiction prevails over that of the state. The village elders are regularly consulted in case of a dispute, weddings are sealed with the sacrifice of 9 pigs and when a person dies, the body is placed in a coffin in a rock wall or cave, as the Toradja do in Indonesia . Sometimes, the coffins are also hung from the rock wall. Sagada is a good place to see this. There are graves from 500 to 1000 years old. The mummified remains of the deceased are still in the coffins. If you are surprised by the small size of the coffins, then you should know that the corpses have been mummified by dehydration and placed in a fetal position before being put in the coffin. For a detailed description of the mummification process click HERE . I meet up with Laurent, a French solo traveler and together we explore this mountain area for a week, travelling to Kabayan, Sagada and Banaue and having a lot of fun. These places are known for their old rock tombs and in particular for the beautiful rice terraces, many hundreds of years old, the most beautiful of which are in Batad. We make a three-day trek through the forest and marvel at the beautiful views with the many terraces. But my time is running out, three weeks is too short to see everything in the Philippines. I am forced to limit my visit to the highlights of North and South Luzon. And so I take the night bus back to Manila, which arrives in the city at 5:30 in the morning. A large part of the residents is already up and about. The homeless people are still sleeping on the pavement. And there are many of them, often whole families with small children. I know that there is a lot of hidden poverty in the Netherlands, but this defies every imagination. More than 4 million people work abroad temporarily to support their families, for employment possibilities in the Philippines are minimal. The last week I reserved for South Luzon. A flight is quickly booked and I land in Legazpi, at the foot of the beautiful conical volcano Mayon. I stay there for two days and then travel further to the south. There are said to be be beautiful islands in the area and also a diving location, where many whale sharks are spotted. But I have also heard that the area is very touristy and I do not really like that. I prefer not to dive with 20 others splashing around a whale shark. Hopefully there will be better locations in the coming weeks. Time flies. There is no time to view this part of the country in detail. On December 10 I will be back in Bali again for a short time. And again the bike will stay behind for a few weeks in the guesthouse, because first I want to visit the northern and eastern islands. And, when island hopping, the bike is a hindrance for the large distances are mainly traveled by plane. Flight to Ambon, then flight to Ternate on the North Moluccas, then by boat to Sorong on Vogelkop (Papua), diving on Raja Ampat and hopefully a visit to the interior of Papua in order to visit the Danitribe in the Baliemvallei.